The below story was written two years ago when we had a vibrant bloom from all of the rain. 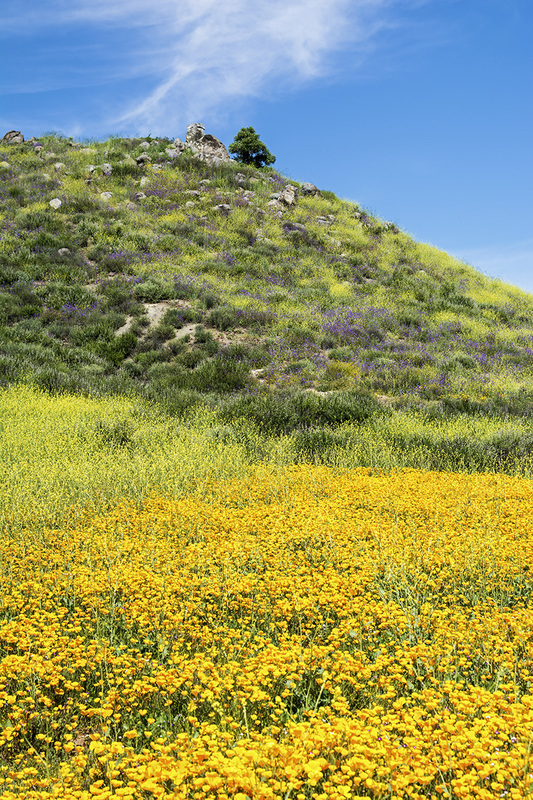 In 2019 they are calling it a ‘Super Bloom’, also because of all of the rain over the winter months. One of the best spots is in Lake Elsinore just off of Interstate 15. However, it has become a mad house with the crowds and people pulling over on the freeway to take photos, that they have now shut the area down. So it is tough to see this year. If you have never seen the poppy fields, here is a recap of them in 2017. After the much needed rain in California for a good part of winter, the flowers are now starting to bloom. I am told that in some areas the hills are full of blossoms unlike anything that has been seen before. The drenched earth is now providing an awesome display of color for our viewing pleasure. I will be making my way to the desert on a jeep tour in about two weeks and I am hoping that the cactus flowers will still be in bloom. 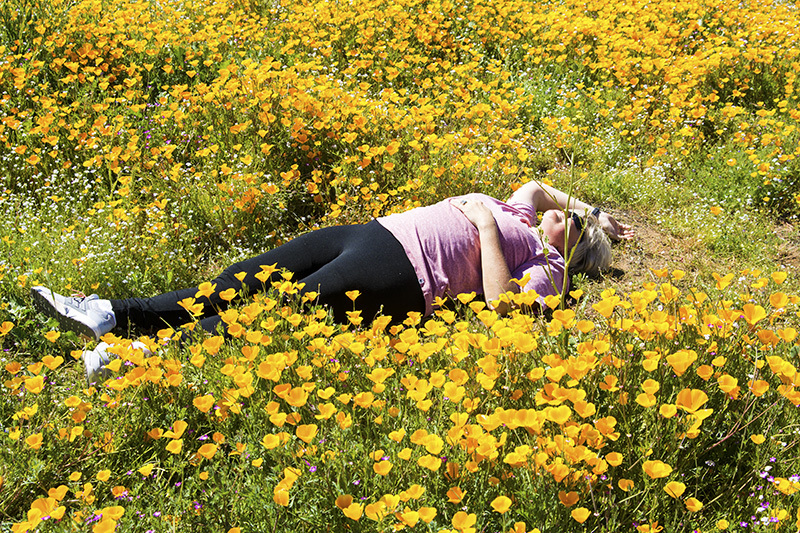 However, for now, I was provided the directions to a few poppy fields in the Temecula and Lake Elsinore area and thought I would check it out for myself. I was given advice to go super early in the morning to avoid the crowds. As a photographer, we know the golden hours for taking photos is normally two hours after sunrise and two hours before sunset. I had an inner argument with myself on whether to get up early or continue my much needed sleep… sleep won. So off to Temecula we drove at a much later start time and to an off-ramp that we were instructed to exit. The first area wasn’t too far from the Clinton Keith off-ramp in Temecula and was like a big bright yellow beacon that we could see from the distance. Since I choose to sleep and not get up early, there were plenty of other people exploring this colorful field as well. A wedding photographer was expertly setting up a shot with a bride and groom for what will surely be a colorful and memorable photo. Kids dressed up in Easter clothes were posing for their parents in between running through the fields, and even a dog was posing for a few shots. As we made our way more into the field it turned out to be larger than I thought. There were poppies everywhere; it looked like something out of the Wizard of Oz. I looked over and staycationer JoJo was laying down next to the poppies and I thought that maybe the wicked witch might have poisoned her. Fortunately, it was just JoJo being JoJo. After snapping some shots, we asked a local if there were any more fields and he directed us up the freeway a few miles to the Lake off-ramp just past Lake Elsinore. 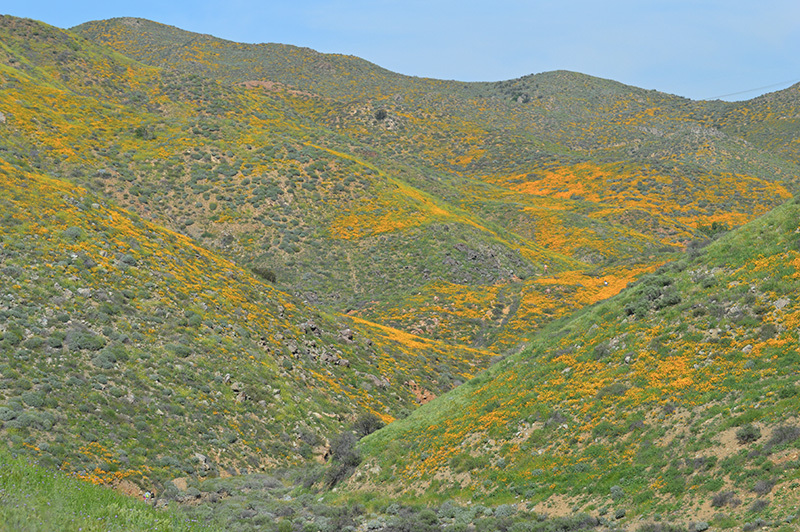 As you approached that exit, all the autos on the freeway started to slow down and you caught your first glimpse of the poppies on the side of the hills. 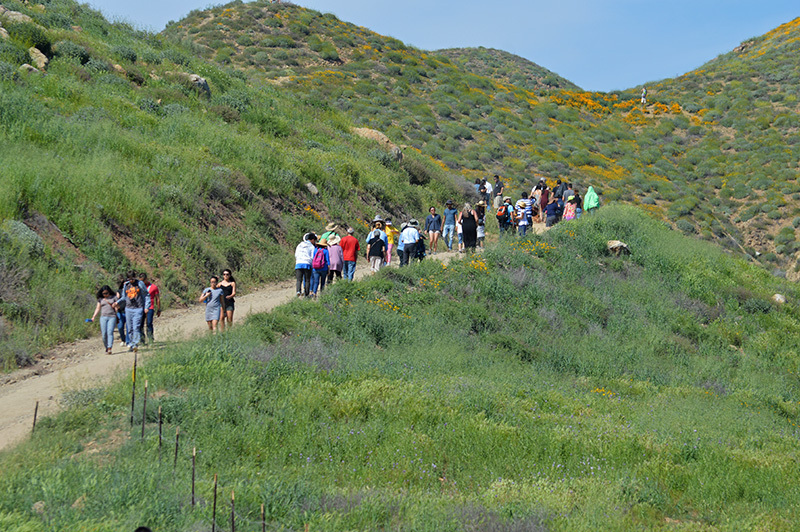 The hills were definitely alive with the colorful flowers but unfortunately also with people. It was packed. The frontage road was filled with cars as far as you could see and I was wondering if I would even find a parking space. Luckily I did and right up front!! There was a trail that took you high into the hills as far as you wanted to hike. We walked a little bit and were able to see the valleys below. 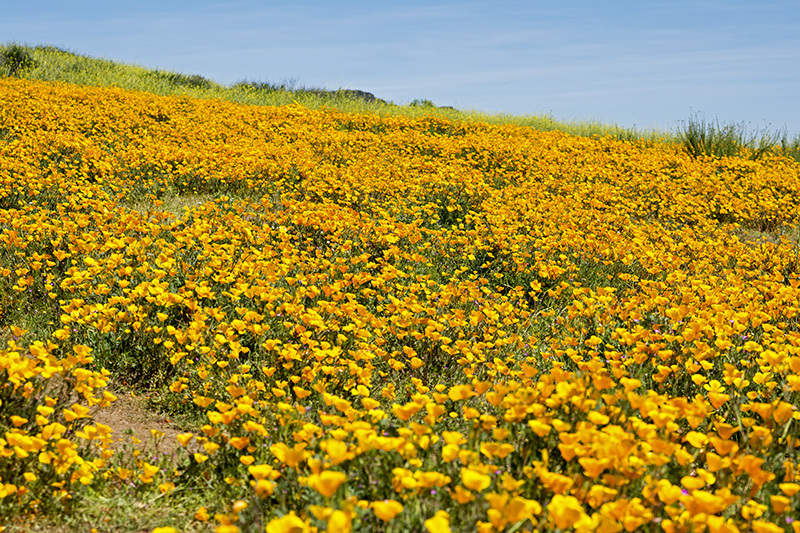 The flowers danced against the gentle wind and contrasted nicely against the equally vibrant green hills. It looked like something out of a beautiful painting, or a dream. 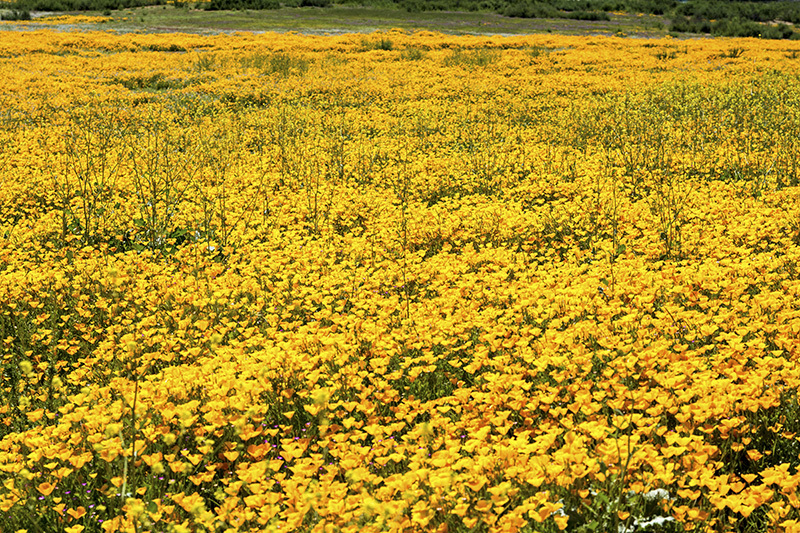 It is definitely worth seeing if you are in the area because I was told by the locals that the flowers are not usually this abundant. 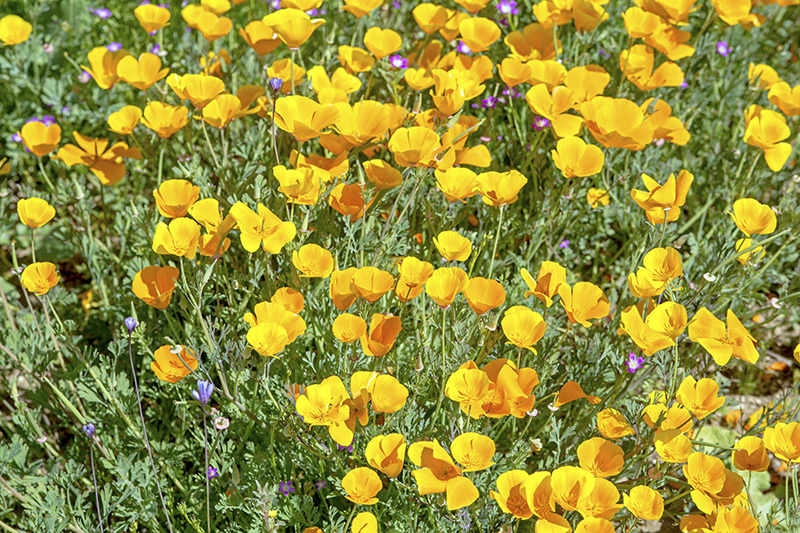 In a few weeks I will be off to the desert and with any luck the flowers will still be there, if not, at least I was able to see poppies… and lots of them.